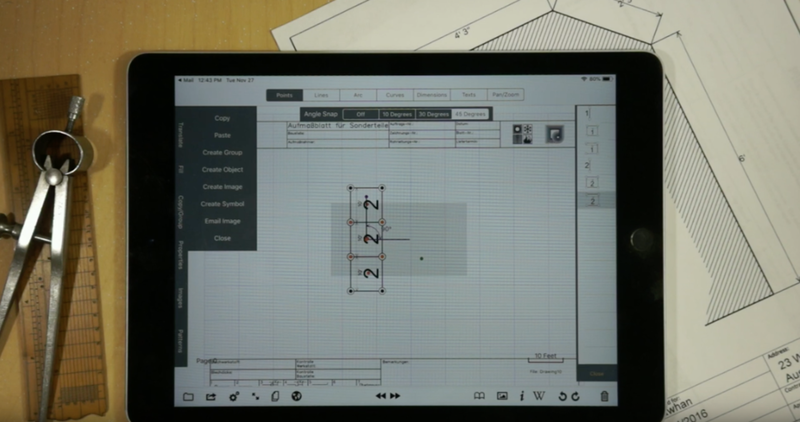 GraphPad Pro is a touch based engineering drawing application specifically designed for contractors who need to make accurate dimensional drawings while in the field. Sketch a design and GraphPad will snap the lines into alignment and leave you with a discrete set of points to work with. Round corners and add drill holes with the exact radius. Add dimensions and translate lines to accurately capture precise measurements. Finish your design by adding pictures, symbols and text; then email it to clients and co-workers while still on-site. In addition to having the best 2D dimensional drawing engine for the iPad, GraphPad can be configured with multiple complex multipage forms. Add all your sales forms and proposals along with a library of all your standard symbols and GraphPad becomes an indispensable tool for your salesmen. Draw up a site drawing while having a conversation with your customer, complete your entire sales proposal right on the iPad and even capture your customers signature! Email your completed contract directly from the iPad, automatically blind copying your office and you can complete your sale on the first visit! 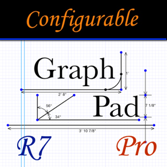 GraphPad – Engineering drawing made easy! Use a Mapview to display appointments. Opening a form automatically populates customer data. 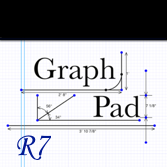 GraphPad is exclusively available through the App Store and runs only on the iPad. Customers who are interested customized versions of GraphPad can contact me via the Contact form on this website for a free consultation. This Freeware version gives users access to all GraphPad's features, but is restricted to a single drawing / drawing page. Users can try GraphPad risk free and see for themselves how easy it is to create accurate scale drawings while in the field, and when they're ready to purchase GraphPad Pro, can email themselves the drawing they created. 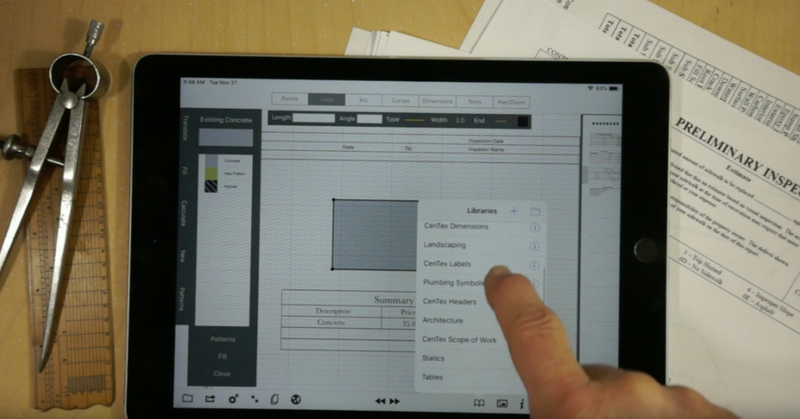 For businesses that want to have all the features of GraphPad with the ability to add their business forms, tables, symbols and calculations - GraphPad C turns the iPad into an indispensable tool for contractors, inspectors and engineers. GraphPad C can be configured for a company, or used as a basis for a completely custom application. Available by lease only. Points mode is used to create a "Selection Area" and to manipulate it's contents. The selection area is one of the most powerful features in GraphPad and is used to move, delete and modify parts of your drawing. GraphPad defines entities by a set of discrete points and the selection area is used to select the points to be acted on, and therefore the entities defined by those points. A line, for example, is defined by two points so to delete a line using a selection area, both points must be selected. The lines mode allows you to add new lines by either touching two points or by touching the screen and dragging. When using the touch drag method, GraphPad will automatically snap to a multiple of 10, 30 or 45 degree angle and the incremental length of the grid. The Snap angle is set in the Points control, but is used throughout the App. Guidelines also help align your drawing for you, and GraphPad will automatically snap to alignment to make it easy to create accurate closed shapes. When using the two point method, the first point will highlight when selected. Touching another point, or another part of the screen will cause a line to be created. Lastly, deleting lines is done by simply double tapping on an existing line, or by using the "Selection Area" as described under "Points Mode". The Arcs Mode allows you to create circles and an arcs between two connected lines. Arcs and circles can have their properties modified by selecting them and modifying the settings in the Arcs control, directly below the main menu when in Arcs mode. To reposition circles it is best to use the Points mode / Selection area (see the video above) and the Points Translation feature. Geometry (Lines, Arcs & Curves) can be Group together so they can be translated and rotated as a unit. Grouped items also maintain scale so if, for example, you wanted to decrease the scale so you could draw more, but didn't want to change the scale of what you had already drawn - you could "Group" that part of the drawing. Then, if you changed the scale, the size of what you had drawn would remain the same and would shink or grow depending on how you change the scale. This video demonstrates how to group items, and change their properties. You can fill your geometry with color by going into "Lines" mode and selecting all the lines around the parameter, selecting the fill side menu, selecting a color or pattern, and hitting fill. The same algorithm used to fill geometry is also used to calculate the area. By counting all the colored pixels and multiplying by the area of a single pixel, GraphPad estimates the area of the geometry. It should be noted, this is an estimate and the accuracy is dependent on how large the geometry is: smaller drawings with fewer pixels will have a less accurate estimated area then a larger drawing. Users can create their own libraries of geometry and images, which they can reuse within their drawings. Library entries can be re-organized and have their properties changed, and will appear in a scrollable form that remains open on the right hand side until they close it. Adding an item from the library to their drawing will automatically update any tables they have added. Images can be added to a drawing directly from the photo library, and the size of the image is determined in the "Settings" form as small(300x300), medium (600x600) or large (1000x1000). Once an image has been added to a drawing, it can be modified by going to the "Points" mode, selecting the image (or images) using a selection area, and going to the "Images" form. Images can be clipped, resized and rotated. In addition, a page can be made transparent, so the page behind it can be seen but will not affect the drawing engine. In this way, a satellite image can be added to the second page of a drawing while the first page is transparent so a user could sketch the roof of a building, for example. Curved lines can be added to a drawing by going into "Curves" mode, touching the screen and dragging along the desired path. Once a curve has been created, it can be modified by moving the points that define the curve in "Points" mode. Points can be moved by touching them directly, or by using the "Selection Area". The response of the corresponding control points and curve segment end points will differ depending on whether or not the selection area is used. GraphPad has two types of text, free text - which is good for making drawing notes, and Form text - which is text associated with an inspection or other business form. Form text can't be moved or modified and is completed by hitting the "Return" button which will tab you to the next field in the form if its been setup. Free text can except returns so to complete this type of text the user must hit the close keyboard key. Changing to a different "Mode" in GraphPad will also close the keyboard and complete the entry for free text. Not properly exiting either types of text entry will cause the text to not complete and it will seem like its been erased. This video shows how to pair with any blue tooth enabled Leica laser tape measure and how to use it with GraphPad. Protecting your private information is extremely important. This Statement of Privacy applies to all my GraphPad products and is required by the App Store for all apps that have either a trial version or offer auto renewable subscriptions. GraphPad offers both a trial license and auto-renewable subscriptions which are purchased through the App Store. GraphPad only handles App Store receipts locally on the device as part of a verification process and does not collect, store or distribute any information. The only information I receive from customers is through the website: www.GraphPadPro.com/contact which is used by customers to report bugs and ask questions. This data is not stored or distributed, and is only used to respond to customer inquiries. GraphPad contains no third party content and has only the following restrictions on it's use. Users of GraphPad are solely responsible for any output or data, and I have no obligation as to the accuracy of any drawings or calculations. GraphPad is available "As is" and although I am continually improving my product, there is no guarantee that any particular enhancement of bug fix will be addressed. Use of GraphPad is restricted to the iPad / iPads associated with the Apple ID of the purchaser and is non-transferrable. Any lease of GraphPad will automatically renew unless auto-renew is turned off at least 24-hours before the end of the current period. Your account will be charged for the lease renewal within 24-hours prior to the end of the current period for the current monthly cost. The lease cost is subject to change without notice, however, auto-renewals will be disabled for accounts affected by any price change. Any unused portion of the 7 day free trial period will be forfeited when the user purchases a lease. This lease may be cancelled at any time by the account holder and auto-renewal may be turned off by going to the iPad's Account Settings after purchase.